We use social media to help people better understand our impact on Hamilton. Please share this Impact Story with your friends, family and members of your community. Linda Hutchinson is ensuring that high standards continue in hospice and palliative care — a legacy that began with her father, Dr. Bob Kemp, a passionate crusader for quality end-of-life care. He played a critical role in bringing palliative care and the Dr. Bob Kemp Hospice into existence in Stoney Creek/Hamilton. 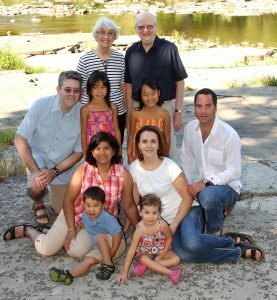 This year, to further her parents’ goals, Linda and her husband Bruce have established the Dr. Bob and Mildred Kemp Palliative Care Education Fund to provide educational awards for health professionals (physicians, nurses and others) to improve their knowledge and skill in the practice of hospice and palliative care. As the need for end-of-life care grows and increases in complexity, specialized education is crucial. “We have started this fund and as we build it up we are making one award each year,” says Linda. “We hope that others will contribute also so that the capacity of the fund to make educational awards will grow in the years ahead.” The couple has also involved their children as part of the advisory group to the fund, to encourage them to carry on the vision and generosity of their grandparents. Linda and Bruce, whose careers have been in education, feel that locating their fund at Hamilton Community Foundation will help attract the broad community support they hope for. They encourage Hamiltonians who care about end-of-life care to contribute to either (or both) of the funds: the Dr. Bob and Mildred Kemp Palliative Care Education Fund for training and education, and the Kemp Hospice itself through the Dr. Bob Kemp Hospice Endowment Fund. Both funds are at HCF. To get regular updates from our Impact stories and blog, enter your name and email address.